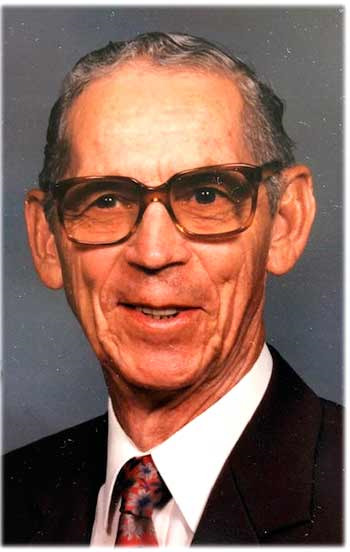 GROVER HILL, Ohio — James Robert Johnson, 97, died Saturday afternoon at his residence in Grover Hill. He was born on Oct. 4, 1921, in Middle Point, the son of the late David Pryce and Nora (Stieversen) Johnson. On Dec. 27, 1941, he married the former Helen Louise Plummer, who also preceded him in death on Sept. 1, 2012. Family survivors include his two sons, Gregory Rex (Lee) Johnson of Roanoke, Virginia, and James Bradley (Bobbie) Johnson of Morrison, Colorado; two sisters, Virginia Ringwald of Annandale, Minnesota, and Erma Johnson of Palmetto Bay, Florida; five grandchildren, Zachary R. (Meagan) Johnson, Megan (Mic) Wilborn, Serge B. (Carolyn Johnson-Bureau) Johnson, Joshua McGregor (Antionette) Johnson, and Jason Johnson; and seven great grandchildren, Jacob, Emma, and Sarah Johnson, Liam and Sean Johnson and Owen and Lilly Wilborn. He was preceded in death by a brother, Benjamin F. Johnson. Bob was a 1940 graduate of Middle Point High School and a World War II veteran of the United States Army. He was a member of Zion United Methodist Church in Grover Hill. He was a tool and dye maker, retiring from Magnavox in Fort Wayne in 1984. He was a life member of both the American Legion and Veterans of Foreign Wars. There will be calling hours 9 - 11 a.m. Wednesday, April 17, 2019, at the Zion United Methodist Church in Grover Hill. A memorial service will be held at 11 a.m. Wednesday, at the church with Pastor Mike Waldron officiating. Interment of Bob’s and Helen’s ashes will follow at Middle Creek Cemetery with military rites conducted by the honor guard of V.F.W. Post 2873 of Grover Hill. Preferred memorials are to Zion United Methodist Church. Expressions of sympathy may be forwarded at cowanfuneralhome.com.